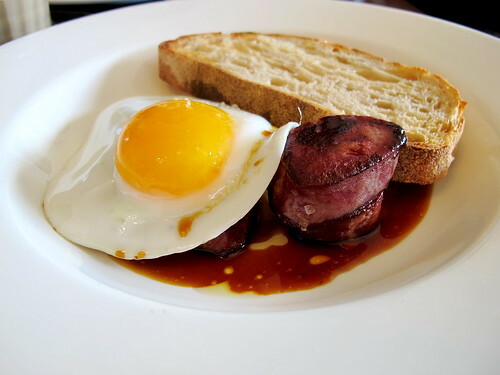 - The FOOD, especially the virtuosic use of British ingredients, the sensible portion sizes (which are often on the smaller side, to take into account the richness of the food) and the always perfectly poached eggs. Below are photos and menu descriptions of the dishes we enjoyed when T and I visited with some close friends of ours one Saturday a few weeks ago. Every dish rocked. 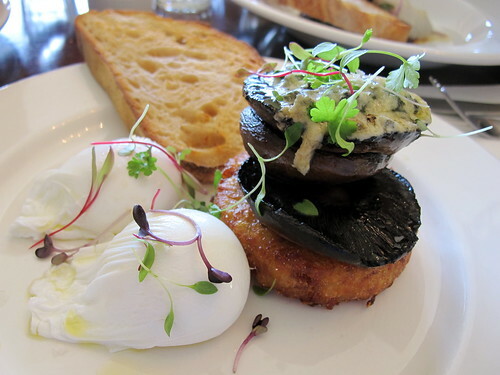 'The Breakfast of Champignons' ($17.50): potato and barley hash with field mushrooms, English Stilton, and poached eggs. 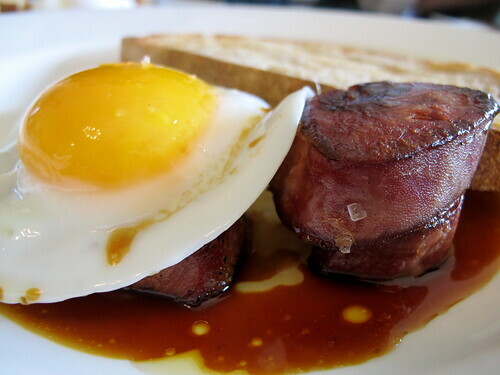 'Idle Tongues' ($16.50): seared ox tongue with smoked semolina, crispy pork neck, and fried duck egg. 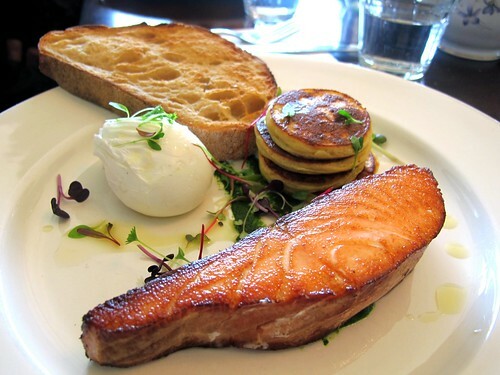 'Prince of Wales' ($15.50): house smoked salmon fillet with potato pancake, poached egg, and sourdough toast. 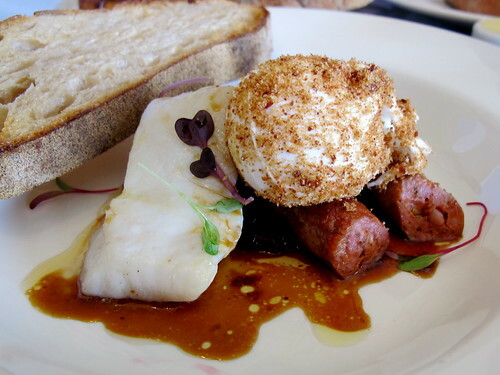 'Royal Fanfare' ($18.50): salt cured trumpeter with spicy lamb sausage, home made chutney, and crumbed poached egg. 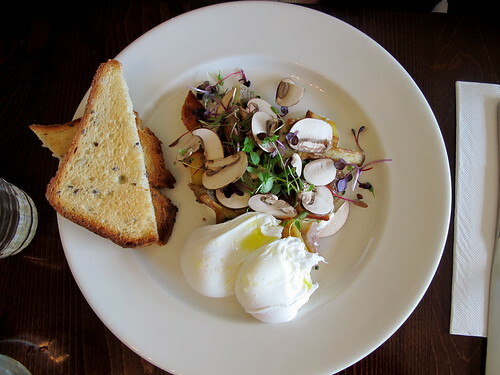 'Simple Pleasures' ($15.50): globe artichoke with sauteed potato, goats curd, and warm chestnuts - pictured with poached eggs ($2 extra) and gluten free bread. You know you're a coffee nerd when you can look at one of the photos and recognise Talor ex-Seven Seeds and Brother Buba Budan behind the coffee machine. You're killing me, Claire. KILLING ME. Damn my laziness and my car-lessness, they are all that is keeping me from Spotswood. We love the Duchess. I remember our first lunch there we had this amazing bacon soup!! Wish they opened for dinner though. So glad it rocks your world Claire, I love love love them too. (Glad my original recommendation got you to the other side) I often find myself craving a taste of their offering, they care about quality and it shows. Sigh, I swoon and sigh over that Idle tongue dish! Delish! Am hating this place is so far from me...! I am so stoked that you had a super time and that your patience for a table was rewarded. The scoop with opening for dinner is that we are patiently waiting for out liquor license approval with the council. We had quite a number of locals opposing the move, fearing we may start some kind of late night alcohol fueled brawls. Any submissions of a positive nature would be quite welcome. Damn my carless-ness also. This place looks yum, maybe I'll have to dust off the pushy! Wow! If I lived there, Duchess of Spotswood would definitely be my favorite restaurant too! The food looks heavenly especially the Simple Pleasures! Royal Fanfare also seems like a treat! I also think that it's an interesting strategy they've got there with tweeting and calling their customers. Oh dinner would be awesome! The west needs more options for night time eats. Fingers crossed. Wow- thanks for the tip! 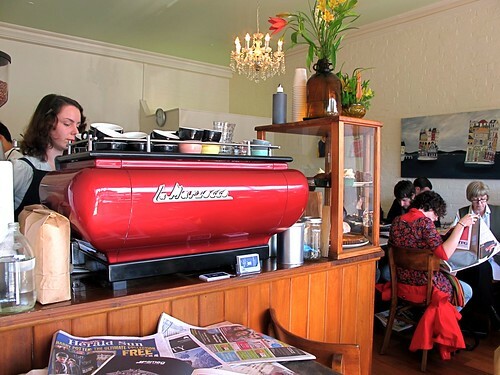 This is one cafe we are yet to visit inner westside! Please follow my Melbourne blog too! Never mind you car - you don't need the Westgate bridge. Take a trip on the Williamstown line and get off at Spotwood. You'll find the Duchess a few hundred metres down the road towards Melbourne road. Worth the trip. My favourite cafe full stop east or west!